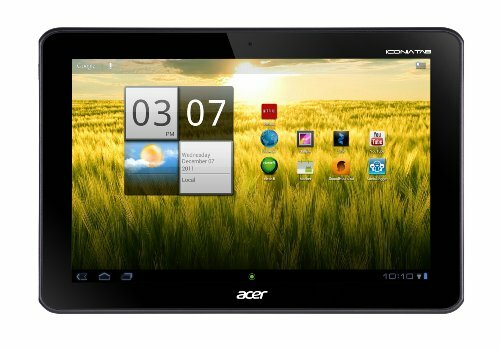 The Acer Iconia tablet has a 10.1-inch screen, an eight-hour battery life, and two standard USB ports for hours of entertainment. It has a sleek titanium grey design and, unlike many other tablets, the Acer Iconia does not sacrifice quality for the price. Its Android operating system runs smoothly for gaming, videos, and app usage; a perfect fit for any user. Access to the Android market gives the user a wide variety of app choices from games to business tools. The tablet also features a front-facing camera with clear resolution great for video chatting family and friends. While the Acer Iconia isn’t the thinnest tablet on the market, it has a textured back panel that aids in gripping and helps avoid breakable drops of the device. This tablet also comes with wifi capability that maintains a strong wireless connection, making surfing the web painless. If you are a student, the 16GB memory on the tablet is a must. If you find yourself needing more memory, the tablet has an expanding memory option via the micro sd slot. Apps such as Google Drive give instant access to school projects and papers. You can even make word docs and presentations in minutes without having to worry about that last second assignment. If you are a business person, the Iconia allows you to effortlessly take and find notes. At 1.5 pounds, the Iconia is the perfect tablet for business trips or even dashes to the office. Portability is part of what makes tablets so attractive, and the Iconia is no exception. The Acer Iconia is also kid-friendly. Its easy interface and access to fun apps for children make this the perfect gift for the entire family. However, if you prefer music over games and apps, the Iconia has a crystal clear speaker for optimal music enjoyment. The Iconia is also extremely customizable. Many tablet devices come pre-set and do not allow for many changes, but the Iconia encourages personalization and creativity. It isn’t hard to see why current users prefer this tablet over others. The Iconia tablet also has a variety of compatible accessories for further personalization. Whether you are looking for a lightweight device for business and school-related tasks or just a fun and easy way to browse the web and play games, the Acer Iconia offers a cheap and reliable solution to both, worth every penny. Brand Name Tablet or off Brand Tablet? Does the Apple iPad have a USB Port? Why would you choose Windows RT over Windows 8 Pro? What Android OS versions support the larger USB ports?